You are here: Home / Sports / Andy Murray, Where From and Where to? Andy Murray, Where From and Where to? England has been in the international eye a lot recently. Following the media frenzy surrounding the royal wedding last year, there was this year the Queen’s Diamond Jubilee. Of course, neither of those could compare in terms of international viewership to this year’s London Olympics. Even greater, then, was the pressure on Great Britain’s own Andy Murray. For the most popular set of American team sports, competition is usually internal, waged between states and cities, rather than countries and continents. While for Murray, the experience of playing against an international host of competitors is nothing new, it can seem strange to imagine the pressure of representing not only your city, but your country, or in Murray’s case your collective of countries in the islands of Great Britain. And as though that weren’t enough pressure, he was playing on home turf. And it seems that Murray did not disappoint. He brought home two metals before his quick turn-around to travel to Toronto for the Rogers Cup. Though his Olympic gold carries important meaning for the British, it cannot completely erase the disappointment of his loss at Wimbledon, a sting both for the loss of title and for the loss at home. But what a difference it must make to win the Olympics in London. In a recent appearance in “Outnumbered”, a popular British sitcom, nine-year-old Karen asks Murray, “Hang on, are you British or Scottish?” to which he replies, “Depends whether I win or not.” This is perhaps a jab at the controversy over his comments suggesting a lack of support for England at the 2006 World Cup. His comments, professedly made in jest, were quickly forgiven with his insistence that he happily identifies as both British and Scottish. He is currently coached by Ivan Lendl, a former world’s number one player. While Lendl’s brand of strict coaching will surely have had a great impact on Murray’s performance, it can’t be called the most important factor, just as it would be wrong to charge too much of his success on his choice of Head YouTek racquets. Surely his performance would be hurt if suddenly every Head YouTek disappeared (don’t worry; they’re not going anywhere), but these are the ingredients for his success, not the core of it. Andy Murray’s gold is the first gold medal won in tennis by a player from Great Britain since the 1920 Summer Olympics in Antwerp. And now Murray, the number one player in Great Britain, and number four player in the world, was able to win a gold at home in London. And still better things are expected. 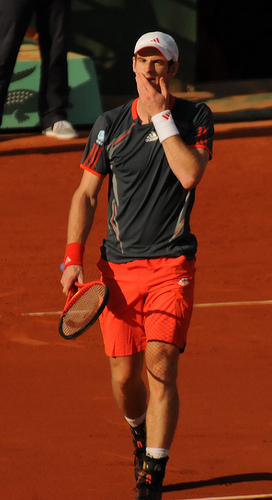 Murray’s competitors anticipate continued improvement from him. Federer expects him to win multiple Grand Slams, and Djokovic has gone on record saying that the traditional “Big Three” should be expanded to four in order to include Murray. So with all of these successes, it is important to remember that Murray doesn’t only represent Great Britain, but also Scotland. With as many notable Scottish personalities as appear in the media, Scotland is still not a country that regularly accumulates a lot of attention in the international spotlight. For that reason it is all the more important to consider Murray’s identification with Scotland as well as Britain, and to consider how the particularities of his heritage contributed to the player he is today. Rachel Greenberg is a freelance writer and editor in the San Diego area. She recently graduated from Johns Hopkins University where she studied English and Writing Seminars. Her most current project has lead her to research and write about professional and recreational tennis. Connect with Rachel on Facebook, or LinkedIn.